If you want to use the budgeting functionality of BW-BPS in SAP BW for hierarchies with one characteristic (hierarchy with postable nodes). Select the hierarchy bearing characteristic for the lead column. Choose "Hierarchical Data Model" and "BW Hierarchy with Postable Nodes". Select the totaling logic you wish to use for the budgeting function. Mark "Check Entry" if you want to ensure, that the not assigned values are not below zero. 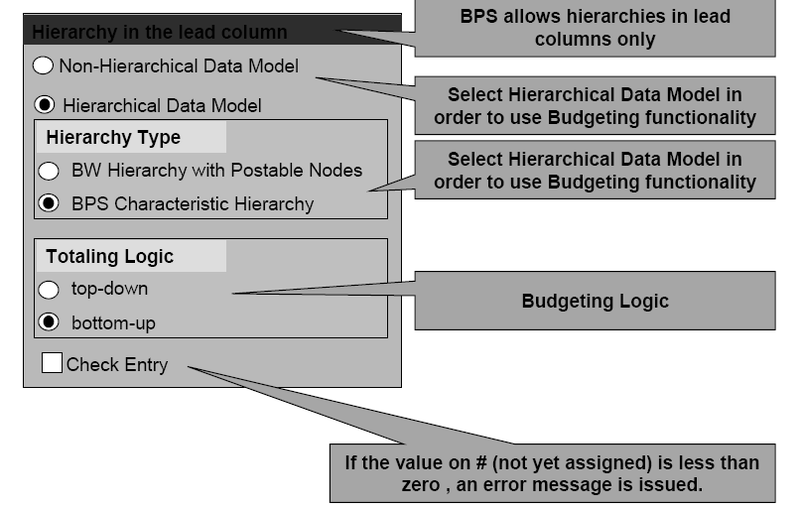 If you want to use the budgeting functionality of BW-BPS with hierarchies with several characteristics (e.g. product group, product). In the planning area create characteristic relationships which reflect the relations of all characteristics used in the hierarchy you want to display. Usually you use the respective hierarchy to do so. (You could as well use attributes in order to derive the relations). In the planning level select all characteristics that are used in the hierarchy you want to display. In the planning level/package select all characteristic values you want to be displayed. Make sure you include the "initial value" which in this case means the "not assigned" #-symbol. Select all characteristics that are used in the hierarchy for the lead column (e.g. product group, product). define the sequence of the characteristics the same logic as in the hierarchy (e.g. 1. Product Group, 2. Product). follow the same steps as described in "Handling of hierarchy display for BW hierarchies with several characteristic nodes" it is not mandatory to use characteristic hierarchies for BPS characteristic hierarchy display. If no characteristic relationship rule exists for the characteristics chosen in the level the system will just create all possible combinations of characteristics used in the lead column and display them as a hierarchy. characteristic values are assigned more than once to a node. characteristics of the lead column of a layout. 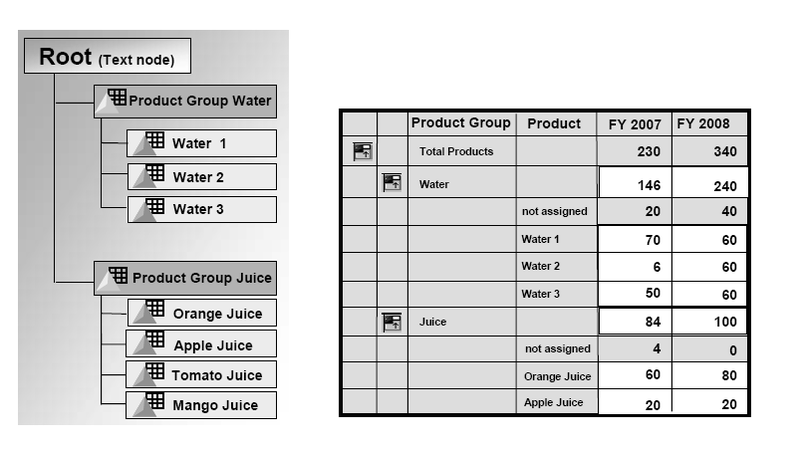 If you want to use the budgeting functionality of BW-BPS with no BW hierarchy.this type of "hierarchy" is just temporary (virtual) and does not necessarily mirror the hierarchical structure of your data model. follow the same steps as described in "Handling of hierarchy display for BW hierarchies with several characteristic nodes"
it is not mandatory to use characteristic hierarchies for BPS characteristic hierarchy display. If no characteristic relationship rule exists for the characteristics chosen in the level the system will just create all possible combinations of characteristics used in the lead column and display them as a hierarchy. The validity area of BW-BPS hierarchies always refers to only one specific layout. The budgeting mode is set in the layout builder. Bottom up and top down mode are available in both planning with BPS-Hierarchies and in planning with BW Hierarchies with one characteristic. Top-down is chosen, when the planner is supposed to assign a fixed budget in his area of responsibility manually to hierarchy nodes and leaves he is responsible for. Once the budget is fixed and changes are made in the hierarchical lower nodes then the value on "#" is changed.When changes are done to the budget (budget correction in another layout/level) then the total and the value on "#" are changed. In the bottom up mode the budget is not fixed and can be seen as a proposal which the planner may overwrite. If you do changes on a lower level then the value on "#" stays the same but the total is changed. If a budget change is done on a higher level then the difference is written on the value "#". Both modes can be used in a counter current planning scenario. The administrator can switch the mode of the layout according to the phase of the planning. Great Article, thanks! I always had trouble with the characteristic hierarchy. Thanks for sharing great information in your blog. Got to learn new things from your Blog . It was very nice blog to learn about SAP ABAP.